Eggy Alphabet features fun animations and visuals, cute sound effects and catchy music- keeping kids learning for longer. Reading Eggs has just launched its new Eggy Alphabet app for iPad. The app features 5 different games that help children identify and write all uppercase and lowercase letters of the alphabet. 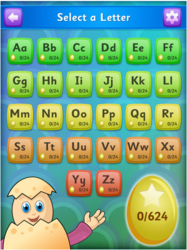 Reading Eggs offers a COMPLIMENTARY version of the app, which includes four alphabet games for the first five upper and lower case letters of the alphabet – that’s 40 activities in total – as well as The Letter Game. The upgraded version of the app can be purchased for $2.99. Both apps can be purchased from the apple app store. The Reading Eggs program (ReadingEggs.com) was developed by a highly experienced team of teachers, educational writers, animators and web developers. The Reading Eggs program focuses on a core reading curriculum of skills and strategies essential for sustained reading success and is suitable for children aged 3+ who are learning to read. Reading Eggs is a division of Blake eLearning, which specializes in creating high quality literacy products for schools and educators throughout the world. Blake eLearning is based in Australia and its educational books are successful in all major English speaking markets. The company is a recognized leader in creating innovative, exciting programs that both teachers and children enjoy using.